Are you looking for topsoil suppliers in Hampshire? Abbey Turf is here to cater to all of your topsoil needs. Keep your land in great condition with our healthy, organic topsoil products. Whether it’s for a garden or a farm, we can supply the exact amount of topsoil that you are looking for. With a site spanning over 180 acres, our Hampshire topsoil suppliers can provide as much or as little topsoil as you require. Our topsoil is inspected on a daily basis by using a thorough screening process to ensure it is in the best condition for our customers. We make sure that there are no weeds or unwanted items present in your soil so that it will encourage healthy growth when applied to your land. The maxi bags that our topsoil suppliers in Hampshire provide are light enough to be lifted over fences, which may make application easier. With these easy-to-manage units, the topsoil can be easily passed to colleagues or others so that it can be laid quickly and effectively. You will notice the dramatic improvements our topsoil will have on your land in no time. As we deliver all topsoil in maxi-bags, this allows for a clean and smooth topsoil suppliers Hampshire delivery service, with minimal fuss. The depth of your topsoil is up to personal preference, although our topsoil suppliers in Hampshire recommend one maxi-bag to create an inch-deep layer across approximately 30 square yards of land. If you are not sure of how much soil will be best for your requirements, feel free to contact a member of our Hampshire topsoil suppliers team and we will be happy to help. Unlike other topsoil suppliers in Hampshire, we offer a flexible delivery service to our clients. We will arrange for your topsoil to be delivered directly to your site at a time and date that is most convenient for you. Morning or afternoon, our topsoil suppliers Hampshire delivery service can accommodate you. The time between sourcing your topsoil and delivering it is kept at short as possible to ensure that you get the freshest product. We deliver to all areas of Hampshire including Southampton, Winchester, Romsey and many more. To find out if we deliver to your area, check out our deliveries section. Make the most of our topsoil suppliers Hampshire service by getting us to lay your organic topsoil for you. Our staff are skilled in all areas of garden and will work with you to tailor all garden projects to your desired tastes. We can provide you with a FREE no obligation quote for your landscaping, from design through to construction. As well as being the first choice of topsoil suppliers in Hampshire, we offer a number of other fresh products that are perfect for all your gardening needs. We provide the freshest turf that has been produced in-house. Our topsoil suppliers Hampshire service offer different types of turf depending on your land environment. We have lawn turf that is designed specifically for domestic land to give your garden a lawn that will make the neighbours envious. We never buy our turf from other topsoil suppliers in Hampshire, and we are one of the only places that does not grow their turf on netting. We are able to produce turf all year round, and every roll measures 1 square metre. 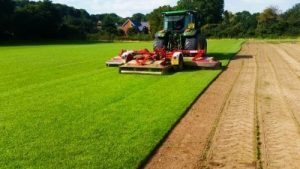 Just like all of our products, our topsoil suppliers Hampshire service cut all turf fresh to order, so that you receive only the best quality products. As an alternative or in addition to using topsoil in your garden, our topsoil suppliers Hampshire team recommend investing in bark chips or mulch. Both make a great addition to any garden and can be used for borders and to define the perimeter of your garden. Bark chips can add an aesthetic element to your landscaping but they are also extremely functional in deterring weeds from growing. Our topsoil suppliers in Hampshire can provide bark chips or mulch in cubic meters. If you are unsure how much you require for your garden, one of our team will be happy to discuss your project with you to determine how much is right for you. 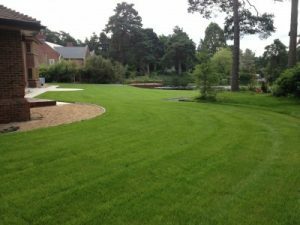 There are many factors that make Abbey Turf the best choice for topsoil suppliers Hampshire has to offer. We provide topsoil to both private, commercial, and trade clients across Hampshire including golf clubs and local authorities. Many customers come back to Abbey Turf time and time again as they know they can expect quality products at a competitive price. Whatever you wish to achieve from your newly enriched land, our team at Abbey Turf will be happy to offer their expert advice. We can advise you on the different types of products we stock, and how best to prepare the land for your new topsoil among many other things. Contact our topsoil suppliers in Hampshire by calling 02380 812302 or email us at info@abbeyturf.co.uk and we will be back in touch shortly. Updated on 24th February 2017.